It wasn’t difficult to convince my new neighbor Jenny to get up at 3:00a.m. on a Monday morning. She had just arrived from the U.K., and was eager to experience Dominica’s Carnival. I had invited her to join a “band” organized by staff at the Royal Bank of Canada for the traditional pre-dawn street party called J’ouvert. 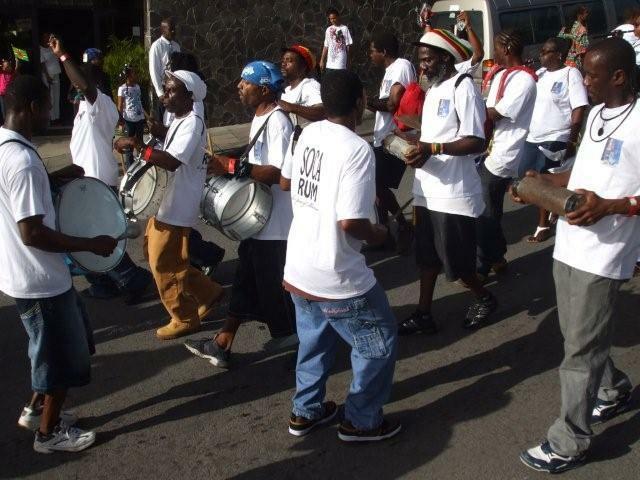 It’s the official start to two days of Carnival celebrations in the streets of Roseau. The main road was lively and loud as we drove through dimly-lit streets. We arrived in town around 3:30 a.m., in time to enjoy the popular Swinging Stars band, who had been serenading a gyrating crowd at the Fort Young Hotel all night. It was rather cool at that early hour, but we warmed up quickly, moving to the pulsating beat and the sweet sound of Chester “Daddy Chess” Letang. At minutes to four, we abandoned the band and walked quickly down to the Bayfront. We stationed ourselves in front of the Royal Bank of Canada, where a few other revelers were being served coffee by our hosts. They had organized a traditional lapo kabwit (goat skin drummers) band to accompany us on our ‘chip’ (quick walk to the beat) around Roseau. We were all attired in colourful caps and brightly painted tee-shirts. A catered breakfast would be served later. Shortly after 4 a.m., we took to the streets with the Gutter Lapo Kabwit band. We were apparently the first band on the road, and as we chipped through the dark streets, small crowds gathered along sidewalks, people peered down from balconies or peaked out from behind jalousie shutters. It was a clear, dry morning and the stars twinkled above us. Jenny and I were mesmerized by the persistent beat of the drums, the drone of the “horn” and the chanting of band members. With only spring water to sustain us, we kept time with the growing throng as we moved along. Once we were into our second lap around the designated route, many masqueraders appeared out of nowhere: men dressed in drag; bodies covered in paint; sophisticated masks concealing identities; and plenty of people in pajamas and housecoats. Just before daybreak, Jenny and I were sure we sensed seemingly incognito spirits of Carnivals-past roaming the streets. Such was the aura of mystery and magic created by the reveling crowds. As the sparkling stars faded into pale blue sky, the shadowy mountains above the Roseau Valley added an eerie backdrop to the ethereal atmosphere. But the mood quickly changed when our band came to a dead stop behind a big truck. 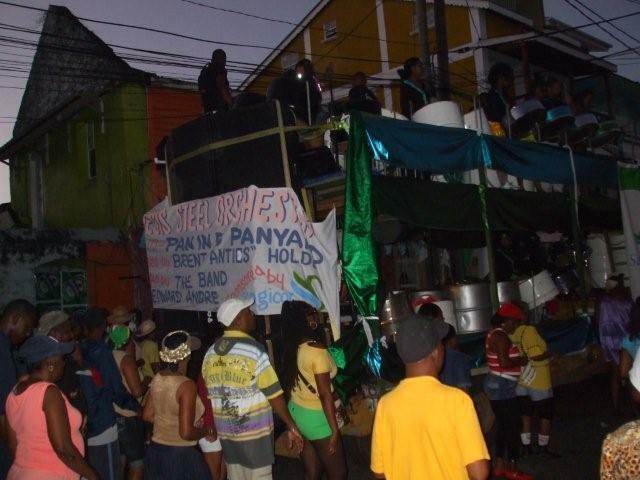 Perched on its two levels was a group of steel pan players who were surrounded by a huge gathering. Jenny and I stepped away from our band and stood alongside to absorb the beautifully blended harmonies emanating from the Genesis Steel Orchestra. Within minutes, it was broad daylight. We rejoined our band and headed back to the Royal Bank for our breakfast. J’ouvert stopped as suddenly as it had started. After a short wait, we gathered our freshly prepared meals and propped the containers on the seawall along the Bayfront. There, we devoured a traditional Dominican breakfast – Jenny’s first, but definitely not her last. She rapidly consumed seasoned salt fish, boiled egg, green salad and freshly baked bread. I was not far behind her. We lingered awhile and watched a cruise ship easily moor herself alongside the pier. However, we were both craving coffee, as we had not imbibed before hitting the road. We decided to revisit the Fort Young Hotel, and seated ourselves at their lovely Waterfront Restaurant, which is situated directly over the sea. We reviewed the events of the morning while gazing at idle sailboats, serene surf and the prominent promontory of Scott’s Head in the distance. When I glanced at my watch, I could not believe it was only 8 a.m. The day had already been filled with so many wonderful experiences. 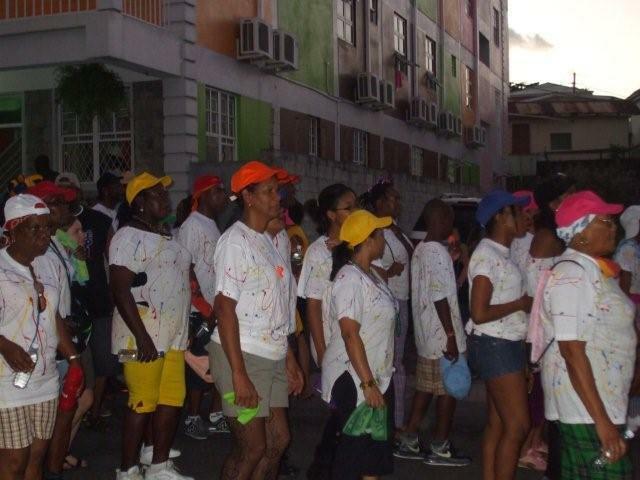 I can only hope that next year’s J’ouvert will be as much fun as this one! Copyright c2011 by G.M. Whitford. All rights reserved.